Public Art From my 1977 mural on the Strand Theater in Ithaca NY, to current involvement with community based public art, almost all my work connects to a broad public. The examples I have chosen illustrate my varied approaches to the field, which I believe has to respond to the specific needs of people and location. Most of the projects were commissioned and some were simple started by me. I am usually the primary author, but in some projects authorship is dispersed among participants. 6 mobile elements with variable dimensions. Tyvek, acrylic, carbon fiber, and aluminum, commissioned by the Greensboro Library Art Foundation. The six mobiles evoke narratives that are open for interpretation. Created in collaboration with students at Wake Forest University, the ultra light mobiles are hung on bearings that allow them to move slowly in the ambient air currents. The work is located in the atrium of the Benjamin Branch of the Greensboro NC Library. Cast and carved concrete, 3’ x 2’ x 84’, commissioned by the Chapel Hill Arts Commission. 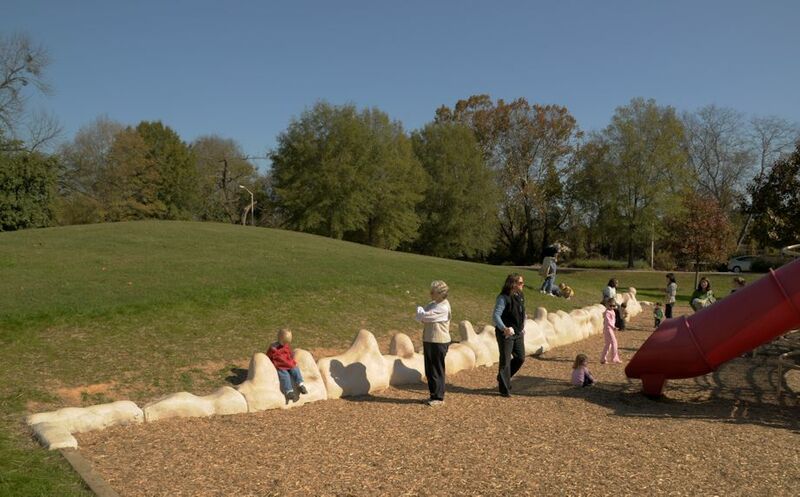 The Sculptural Climbing Wall was designed to hold up a low hillside at the Community Center Park, provide an amenity for children and adults at the park, and at the same time make the viewer aware of the shape of the hill. The contrasting white concrete shapes are whimsical and seem highly exaggerated, but they also function as seating for adults and a safe play feature for small children- the primary users of the park. Steel, stone, and plastics, 5 x 14 x 8 feet. This handicap accessible double chess table was created for a sidewalk site in downtown Winston-Salem. It is used by pedestrians and for chess association tournaments. Sponsored by the Winston-Salem Scholastic Chess Association for Winston Square Park, Winston-Salem, NC. ‘Big Tent’ grew out of collaborative art project between art students from Wake Forest and area High Schools. Students were paired together for discussions about race and diversity that resulted in a series of art works called “Transforming Race”. When the work was finished and exhibited, participants asked that we show the work in our high schools, and seek a way to recreate the process of talking together about race and creating art from those conversations. 'Big Tent', an event tent that would travel to area event came out of that vision. Finn built the tent and voluntteers painted it with 100's of personal 'emblems'. The Big Tent is vinyl, 25 feet in diameter, and available for events and travel. ​3’x 25’ Steel and ceramic tile. J.D. Diggs Elementary Magnet School for Visual and Performing Arts, Winston-Salem, NC. Wake Forest students worked with Finn and students and teachers at Diggs to create the ceramic tile that covers the tower, which is placed near the school entry. The five levels of the tower correspond to each grade and are based on their curriculum of social studies, reading, performing arts, ecology and math. The school was relocated and the work is currently orphaned.on the site.